Mention the Chisholm Trail, and you’ll conjure up visions of the Old West. Today, you can find a modern version of the frontier pathway in CentralTexas at Chisholm Trail Winery--not so different in its rural setting, but with a final destination far removed from the semi-cultured establishments of that era. Follow the long country road--through the woods, past Longhorn cattle grazing freely and quarter horses roaming the open range (with a couple of llamas and potbellied pigs around, too) to a small valley nine miles west of Fredericksburg. Set in a quintessential Western landscape, Chisholm Trail Winery is as fine a place to sample delicious wine and spend a lazy afternoon as you’ll find anywhere. Escape the hustle and bustle of the city with a picnic by Spring Creek, located on the Chisholm Trail property; then stroll over to the winery’s tasting room for a refreshing glass of light, fruity whites or dry reds. Chisholm Trail is the creation of Paula Williamson and Harry Skeins, two former attorneys, who purchased the property in 1992 with the dream of making quality wines in Texas using only Texas grapes. They spent three years learning vineyard techniques and wine making, including many hours under the tutelage of master wine maker Vernon Gold, and planted the first five acres in 1994 with Cabernet sauvignon plants. 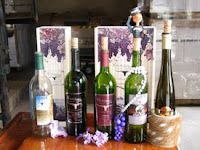 The first wines were released in 2001. Today the winery has tank space for 15,000 gallons. 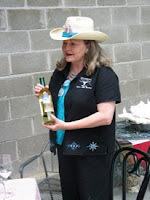 Paula is one of only seven female wine makers in Texas. Featuring premium estate bottled wines in a beautiful Hill Country setting, Chisholm Trail Winery meshes Western heritage with contemporary panache to provide a fun atmosphere in which to enjoy the products. No stuffy people sniffing and swirling here. 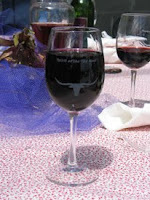 Paula, wearing a bright turquoise shirt and matching band on her cowboy hat, pours samples into Longhorn logo glasses, while live music entertains guests on the tasting room’s patio. For $12 you can taste every wine produced here, and there’s a real variety. For example, Ghostrider is a sweet white merlot while Jackass Blush kicks in a tropical taste of orange blossoms, key lime pie, and mango. Their 2006 Diablo is dry and spicy, but for a mellow dry red sip Lil’s Red Satin. Why don't you google Harry Skeins ? Makes for interesting reading.